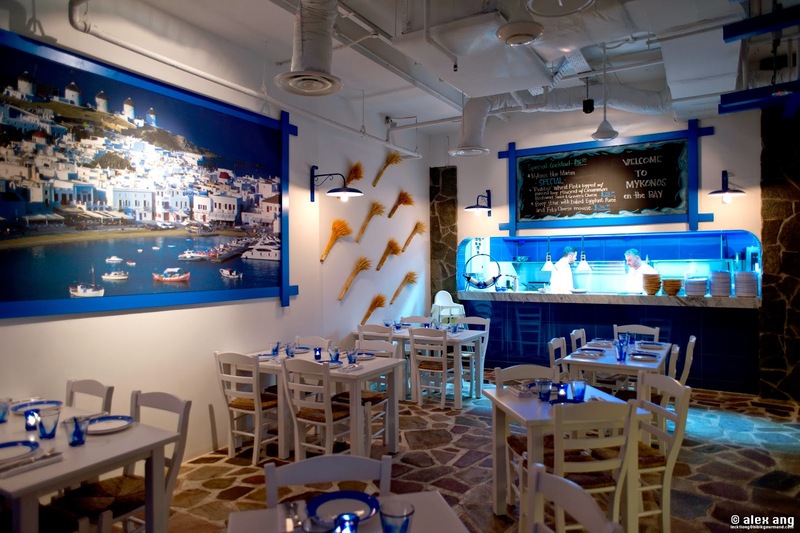 The dearth of Greek eateries in Singapore has made the recent debut of Mykonos on the Bay (“Mykonos”) one that is steeped in anticipation. 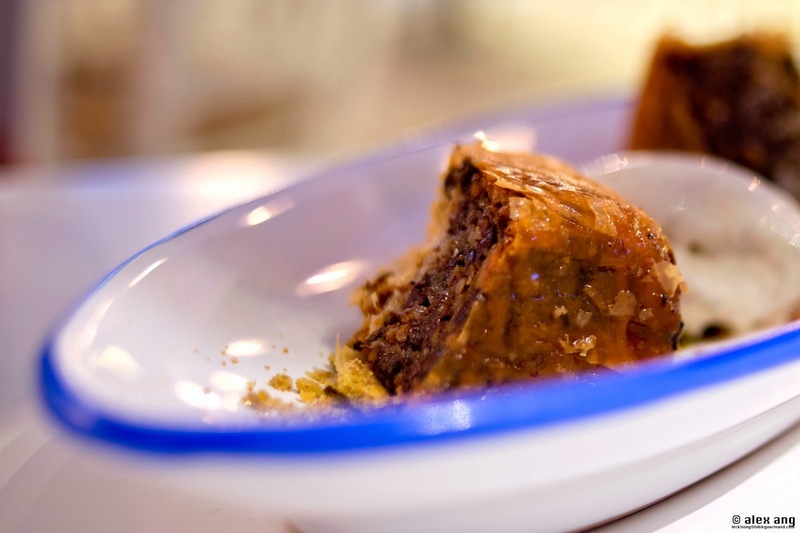 Since Blu Kouzina staked its claim on our turf, bringing the exotic and vibrant flavours of this Mediterranean-meets-Middle Eastern cuisine to a city served by more Italian eateries than we need, we’ve long been hankering for the rise of the Greek taverna. 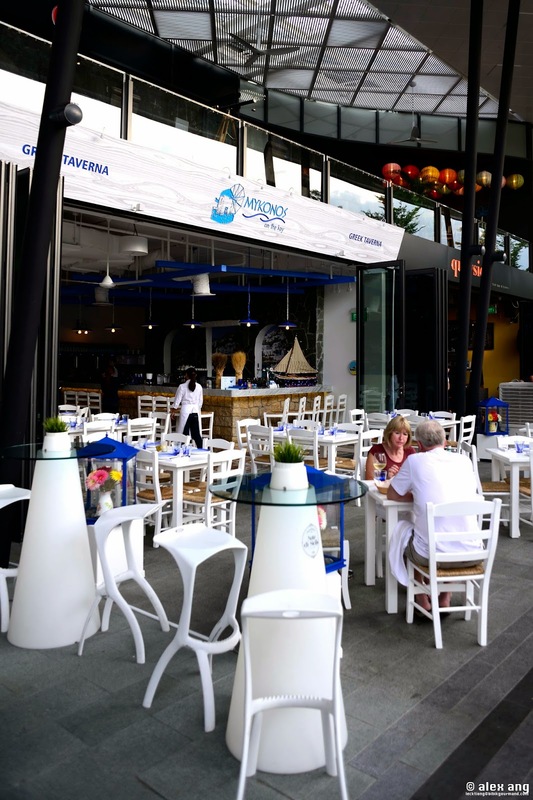 God’s answer to our plea arrived last December (2013) by way of a eatery perched on the southeastern shores of Sentosa’s Quayside isle. Owned by the Greece-loving Italian F&B entrepreneurs – Gerri Sottile and Mauro Muroni – behind Cuigini, Sole Pomodoro and Los Primos, this airy non air-conditioned eatery is sited aptly by the water’s edge, offering all the physical trappings of a taverna including exposed brick bar, hardwood flooring, stucco white walls and a charmingly kitschy blue-and-white décor. The menu, devised by Muroni (executive chef of the group) – who spent 2 seasons working in Greek kitchens – and deftly executed by two Greek sous chef, is a sprawling assemble of mezedes (small plates), artisan breads, salads, mains, meats and seafood from the charcoal grill as well as desserts. To start, graze on an array of mezedes. 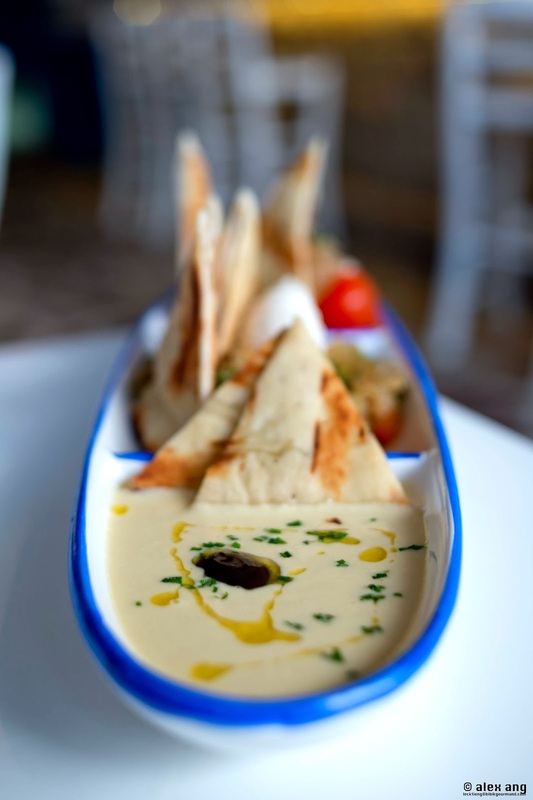 While most will opt for tzatziki (Greek yoghurt spread, S$13.90), a common Greek appetizer, we suggest the Mykonos dip platter (S$27) for its trio of savoury Greek dips – grilled eggplant caviar, broth-like carp roe “taramosalata” and the Santorini-style mashed split pea “fava” – served alongside slices of brazenly cold pita bread. 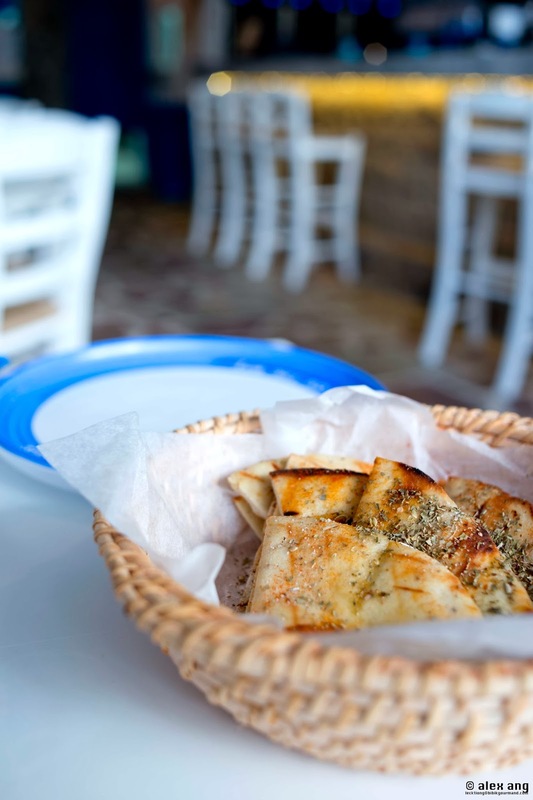 It’s worth noting that breadbaskets at Mykonos are not complimentary but the warm and toasty herbs-flecked pita bread basket (S$4) is memorably delicious and well-worth an order. 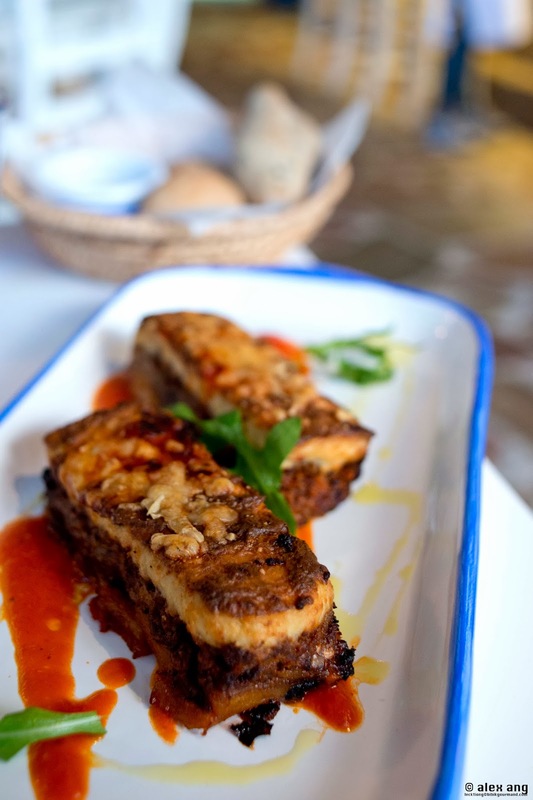 Graviera saganaki (S$15.90) is another commendable starter: sautéed graviera cheese finished with a drizzle of ouzo (an anise aperitif) and lemon juice. While fabulous with warm pita bread, this cheese dish wins raves on its own. 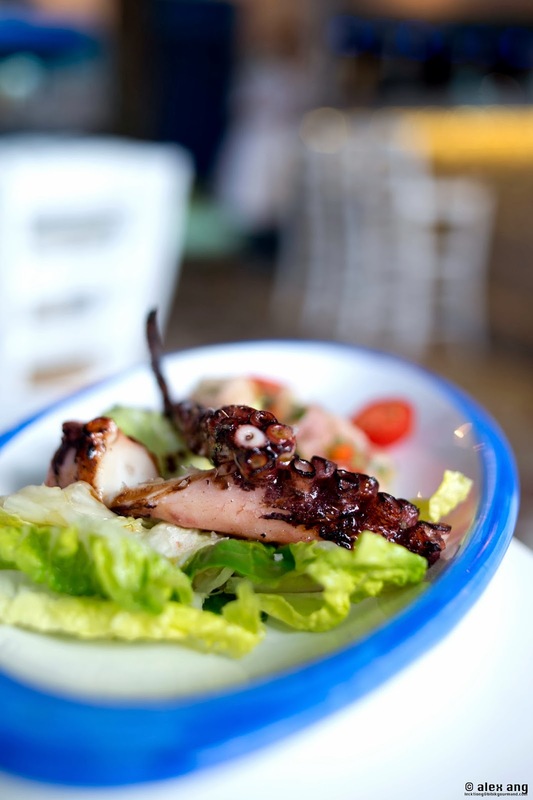 You can’t visit a Greek restaurant without ordering an octopus dish and Mykonos serves this popular seafood starter in 2 ways: grilled chunks alongside braised cubes with the sweetest cherry tomatoes (S$21.90). 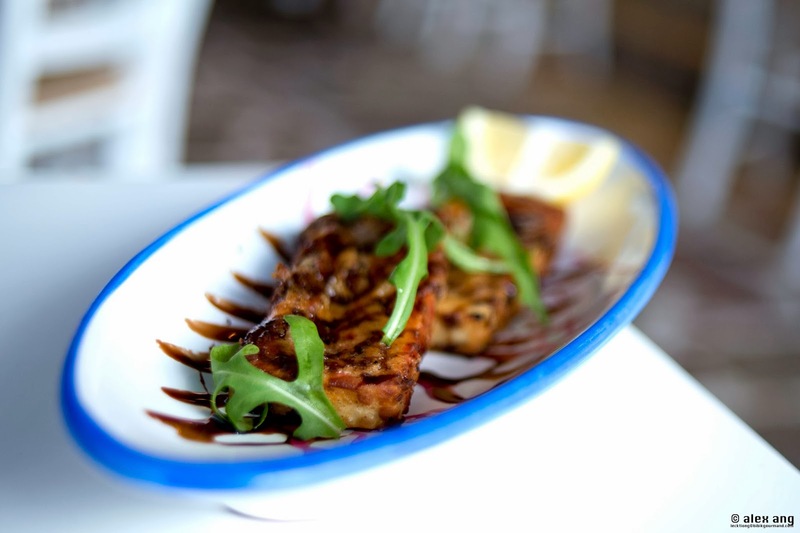 More seafood options abound in mains. 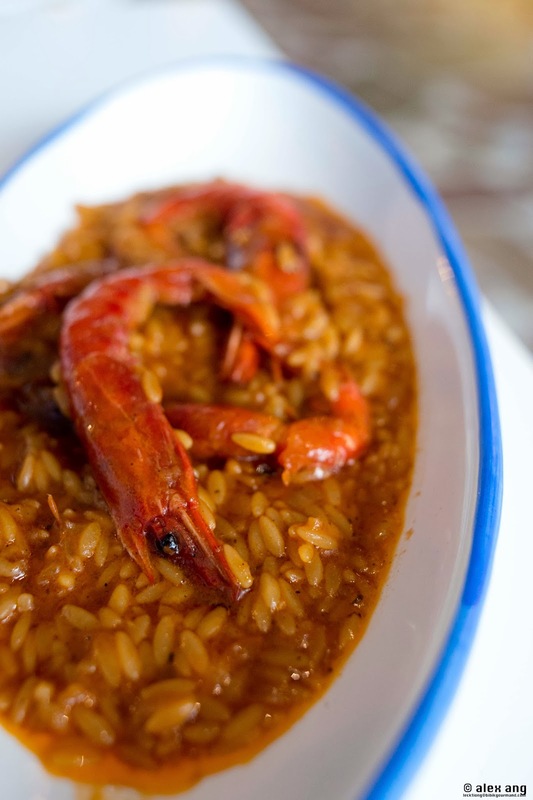 The hearty serving of saffron-accented risoni (S$30.50), a short-cut Greek pasta, in a mellow shellfish jus flanked by Mediterranean red prawn and cherry tomatoes is beautiful as it is deliciously riveting. 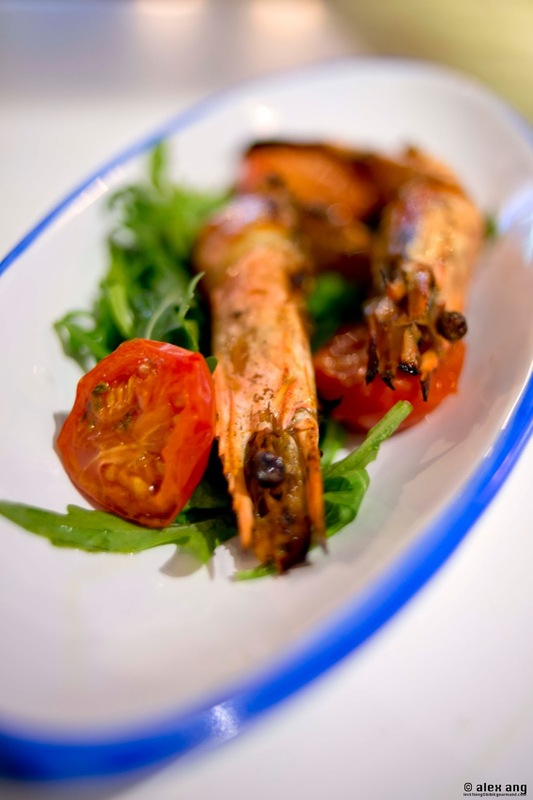 From the charcoal grill, pick from Mediterranean-imported seafood – whole sea bream (S$43.50), whole mackerel (S$43.50) and marinated prawns (S$35.50). Alternatively, the charcoal-grilled mixed seafood platter for two (S$89.00) fields bountiful harvests from the Mediterranean Sea namely prawns, mussels, calamari and/or octopus (depending on what the chefs have in store), with a side serving of delightfully wholesome potato and beetroot salad. Meat lovers are not left out. 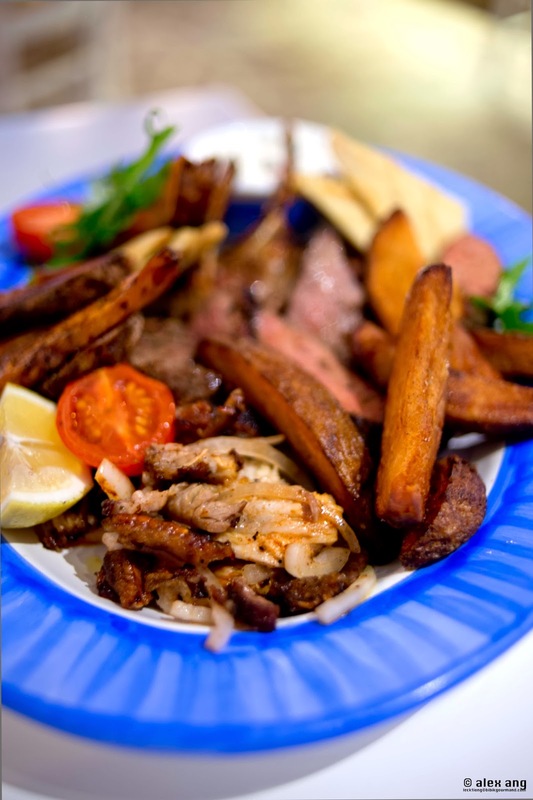 The gyros platter (S$27.50) of house-smoked pork shavings with subtle hints of crispy pork crackling is first rate. The same pork shavings make an appearance again in the charcoal-grilled mixed meat platter for two (S$89.00) alongside house-made lamb sausages, yoghurt and cumin-marinated lamb chops, wedges and/or beef fillet plus other condiments. Compared to the robust flavours of the fore courses, the moussaka (S$27), baked eggplant and minced beef with béchamel sauce, is a shade paler. We reckon a dash of herbs can do wonders to enliven this otherwise pedestrian dish. 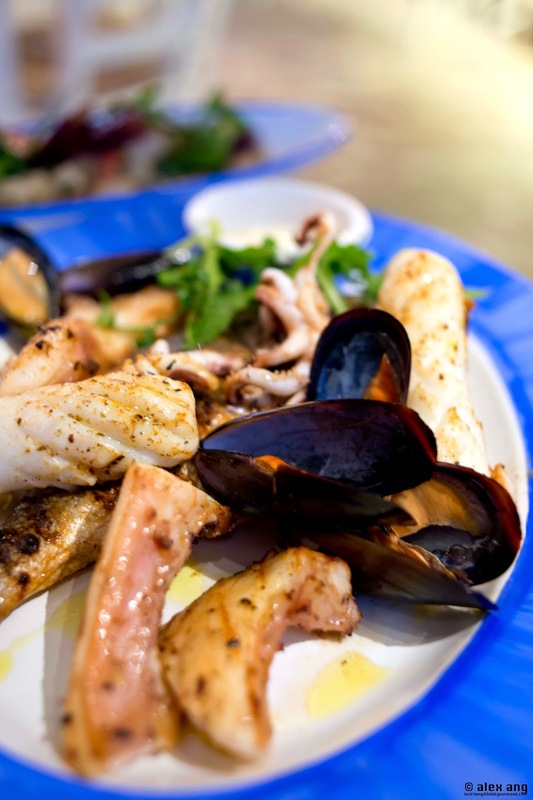 For the most part, Mykonos delivers the taverna promise with absolute finesse. 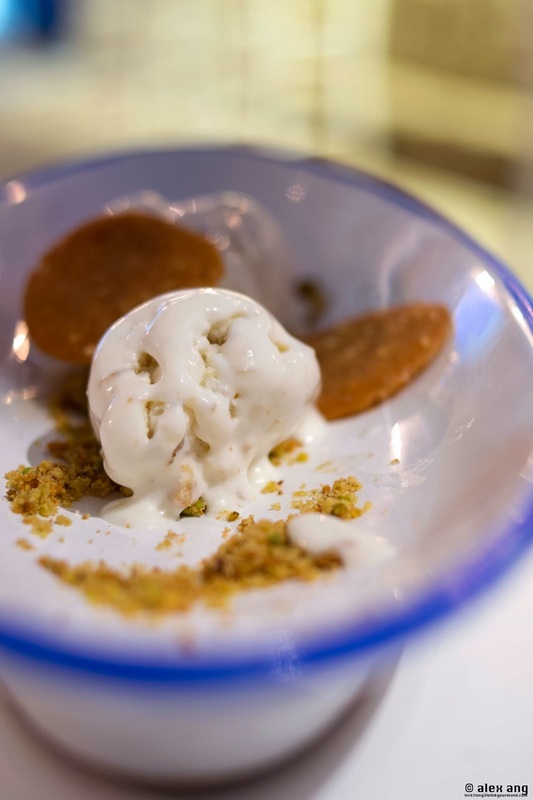 We’d say it’s one-up against the competition thanks in no small part to its gorgeous bay setting and if you have a sweet tooth, you’ll agree that its menu of desserts that veer well beyond baklava (try the Greek yoghurt ice cream with acacia honey and walnuts) is yet another feather in its cap.